Plush pillow-top seat and back for luxurious comfort. open loop aluminum arms with padded armrests. chrome-plated five-star base with nylon casters for easy mobility. casters supplied with this chair are not suitable for all floor types. alternative casters are available to meet your specific needs. 173 of 176 people found the following review helpful. I think I got the shaft...not a sturdy chair. 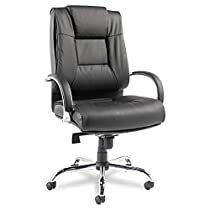 I am re-rating this chair; originally I had rated it much higher but they don't last. This is my second chair purchase of this particular model. I like the styling, fit, and comfort but feel they could make the quality better. The first one I bought lasted less than two years before breaking where the chair sits on the pedestal shaft. There is absolutely nothing wrong with any other part of the chair...just that one small, circular part of the chair bracket that keeps the chair attached to the shaft. All they would need to do is make that one part stronger with slightly heavier gauge metal and slightly heavier welding, which would probably add about $3 to the cost of production, and they would have a GREAT product. I'm dropping this rating down to a 1. I received the chair (this IS the second one I've had) on Aug. 11, 2012 and as of Jan. 31, 2013 the piston that controls chair height is already not working. This chair supposedly sells for anywhere from $550-$700 depending on where you look. The 1st one I bought lasted less than 2 years and the second one for about 5 1/2 months. I am not hard on furniture, I don't "fall" into chairs, etc., both of the chairs themselves still look like new but the piston/connections are shot on both...I'd say I got the shaft! 50 of 52 people found the following review helpful. I've had it about a week. After reading some of the other reviews I tempered my expectations a little bit. I should have never even let them get in my head. My experience has been great so far. I'm a truly big guy (unlike some of the other posters) at 6'8" and 400lbs. This is the most solid chair I've ever had and it sits nice and high so my feet are flat on the ground. Previously, I've always sat half indian style with my legs crossed, which has taken a toll on my ankles. This biggest problem I had was that I had to raise my desk to accomodate me sitting as high as I should. So happy I bought it and regretting not doing it years ago. FYI - if you build things regularly, like I do, the assembly is easy. I've seen a lot of bitching on here about holes not lining up etc. It's common sense not to tighten everything up all the way until you have it fit together loosely, but apparently it has to be spelled out here.